Google aims to provide the answer to any question you may ask it, and with Quick Answers, Google can do that directly from its search engine results page (SERP). 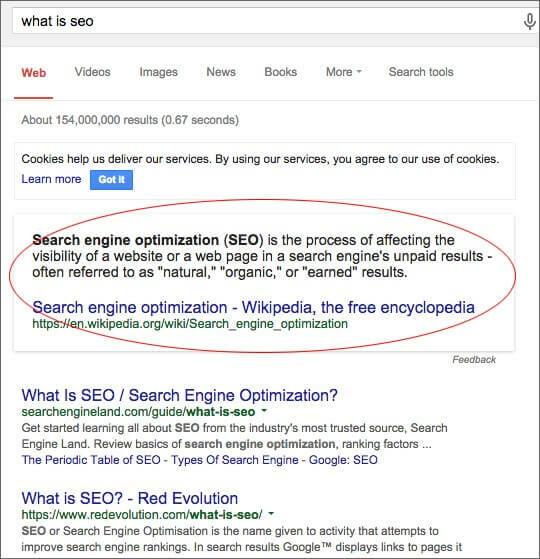 Quick Answers are the highly-visible text snippets that appear at the top of the SERP, providing direct answers and appearing before the first result in the SERP. Quick Answers are desirable because of their prominence. Quick Answers display at the top of the page and usually are the first thing the user sees after making a query. Users can find what they’re looking for immediately and can easily click through to the site for more detail. Many site owners are nervous about the potential impact on traffic – if the user can get all the information they need from Google, why should they click through to the site? Indeed, some sites have found this to be true. Wikipedia, for instance, has seen a decline in organic traffic which may be attributed to the growth of Quick Answers (SimilarWeb). This is likely because Wikipedia specializes in the same rapid response that users can now get directly from the SERP. Additionally, pages that are selected for Quick Answers are generally high-authority pages with well-structured, quality content. These pages are optimized for a great user experience and answer questions closely matching the search queries. For more information on optimizing content for Quick Answers, contact Performics today.